Last week, an entrepreneurship panel organized by the Management and Economics Club took place. 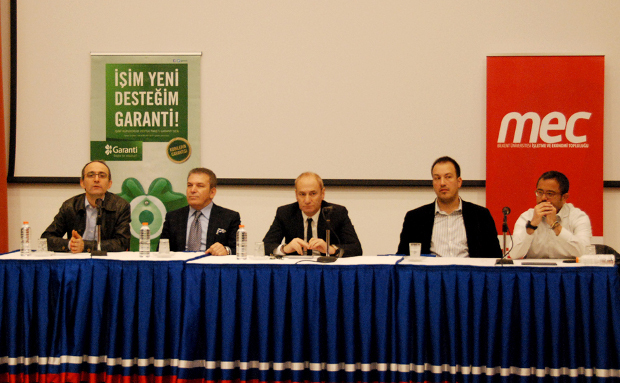 The guest speakers were Emin Çapa, economy director of CNN Türk; Nafiz Karadere, executive vice president at Garanti Bank; Ali Sabanc?, chairman of the board of Pegasus Airlines; Haluk Okutur, founder and chairman of Simit Saray? ; and Fatih Becer, CEO of Pozitron.com. In his presentation, Mr. Karadede stated that an entrepreneur should above all be courageous. He also noted that banks support entrepreneurs who have taken foreseeable risks into account when making their business plans. Mr. Sabanc? highlighted the role entrepreneurship could play in combating the problem of youth unemployment. Noting that in Turkey the rate of unemployment among young people is 20 percent, he stated that the energy of this vital segment of the population will go to waste if new business fields are not generated. He also talked about the reasons a business may not get off the ground, stressing that the real cause of many business failures is insufficient planning rather than a lack of capital. Mr. Okutur gave an overview of the founding and growth of Simit Saray to illustrate what entrepreneurship is capable **************** of. His business, which started with 10 thousand dollars and 4 employees, is currently worth 300 million dollars and employs 6,000 individuals. He stated that he attributes his success as an entrepreneur in part to his use of different sales models and manufacturing techniques.